"Beating or breast for naughty pupils"
I'll probably stick with calling homes. Few question the value of being bilingual. Even fewer know that in New York City, bilingual education is optional, and can be opted out of by parental request. NY Times columnist John Tierney wrote a column a few years ago about a Bronx neighborhood in which, he said, kids had to attend Catholic school in order to be educated in English. This is simply incorrect. When my 6 year old niece arrived here from Colombia, she was placed in a “bilingual” class in a Jackson Heights elementary school. From what I could gather, it was taught entirely in Spanish. She was learning English on the playground, though—I watched her struggle through the words she needed to get others to play with her. It’s particularly absurd to place young, capable language learners in an English-deprived environment. If they don’t acquire English in school and they don’t hear it at home, where on earth are they supposed to learn it? I went to the school and asked that she be placed in a class where only English would be spoken. A strong-minded secretary took great pains to dissuade me, telling me the story of her life, the error of my ways, the wisdom of the ages, and whatever else she could think of until I raised my voice and out came the principal. We had her transferred into an ESL class, where she’d be with other newcomers but only English would be spoken. A few months later, she was fluent in English. Bilingual education is a great idea that’s been degraded through the years. It was originally conceived as a 50-50 proposition, using half L1 and half target language. In practice, it’s sometimes taught by people who almost never use English. That’s a shame. There’s a great book called Mirror of Language by Kenji Hakuta that describes Canadian programs where groups of English and French speakers managed to acquire each other’s languages. In Nassau, where I live, having been priced out of my school’s district many years ago, a few districts offer dual language programs. They’re so named, I suspect, to differentiate them from failed bilingual programs. My daughter has been attending one since first grade. Her class of 18 primarily English speakers is adjacent to a class of 18 primarily Spanish speakers. For part of each day, they switch teachers and must use either English or Spanish as a second language. Now entering fourth grade, the kids are pretty much bilingual. That’s a lot more painless than conjugating verbs in tenth grade, and a lot more effective as well. Language acquisition abilities begin to decline and deteriorate rapidly around puberty, yet most districts wait till then to offer foreign language. After reading Mr. Tierney’s column, I emailed him, telling him the Bronx parents had rights. Mr. Tierney, a strong voucher proponent, chose not to share that information with them. Last year, NY Times education columnist Sam Freedman wrote a similar piece, adding that Chancellor Klein strove in vain to help parents enroll their kids in English-speaking classes. It's disturbing that columnists at the NY Times go public with unexamined information. And it’s remarkable that the NYC Chancellor has not yet been made aware that bilingual education is strictly optional. So you may have heard it here first—if you know kids in bilingual classes that are doing them no good, have their parents opt them out. They have every right to do so. 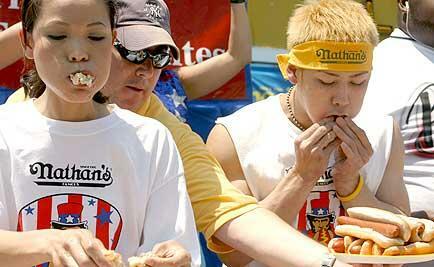 Takeru Kobayashi has once again won the all-important Nathan's hot-dog eating contest, and the mustard-colored belt is returning to Japan. Kobayashi, at 49 dogs, is down somewhat from his record of 53.5, but up-and-coming American Sonya Thomas ran a strong second with 39. And don't forget, Sonya has already established herself as champion in meatball eating, among other things. It's going to be a long road, but we shall prevail. A few days ago, Mayor Mike, more or less with a gun to his head, was forced to give the men and women of the NYPD a contract granting them 5% a year for each of two years. The arbitrator complained that he’d rather have given them 5% a year for four years, but was only authorized to grant a two year contract. Thus, the NYPD has a brand new contract that expired one year ago, and must negotiate a new one. The cops were forced to give back one personal day a year, and cannibalize their young, one of Mayor Mike’s innovations, paying new recruits a princely 25 thousand a year. Police pay will max out at about 59K. NYPD hears a lot of self-serving blather from the like of Mayors Mike and Rudy about what heroes they are, but when it comes time to pay them, neither willingly rises to the occasion. Particularly egregious was Giuliani demanding to remain in office without standing for re-election. He rationalized this naked power grab by saying he had to keep up the "morale" of police and firefighters, all of whom had vainly waited years for him to grant them a contract. NYPD, once Rudy's staunchest supporter, had already begun to demonstrate against him. Nonetheless, through good times and bad, Rudy and Mike could always locate megabucks to subsidize billionaires trying to erect sports stadiums. How cops are supposed to buy homes in this city is a mystery to me. Perhaps Mayor Mike plans to let them sleep in one of the new stadiums he’s subsidizing with transportation dollars.